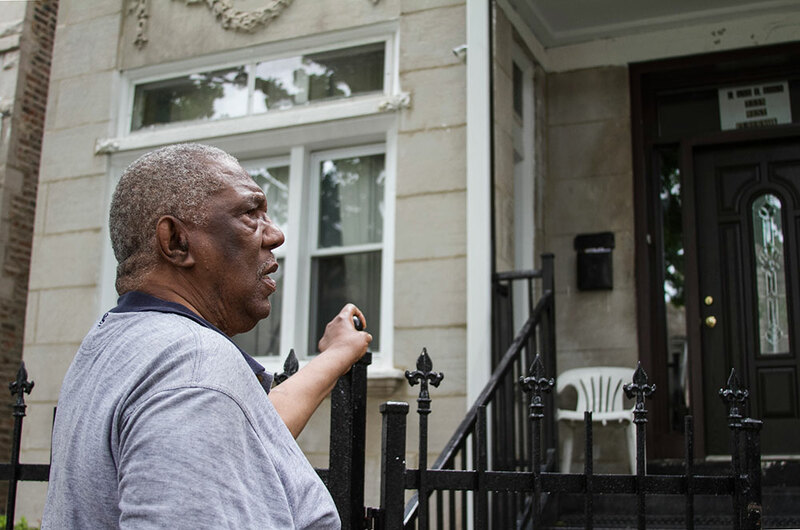 Clyde Ross "bought" his North Lawndale home on contract in 1961. He was able to keep it after joining the Contract Buyers League, which fought for legitimate mortgages by staging a payment strike. In January 1966, the same month Martin Luther King moved into his slum apartment in Lawndale, Monsignor John J. Egan was appointed priest of Presentation Parish in that community. As head of the Catholic Diocese’s Office of Urban Affairs, Monsignor Egan had been training community organizers to work in church communities across the city. After being exiled from his downtown post by a new archbishop and sent to the West Side, he settled into the community and brought in Jesuit seminarians to do neighborhood organizing with his parishioners and their neighbors. One day in July 1967, one of those seminarians, Jack Macnamara, learned from a recently widowed woman in the parish that she had bought her house on contract at a drastically inflated price. He reported his discovery to Monsignor Egan. This was the beginning. Macnamara, along with some fellow seminarians and students he had recruited, learned to research property records: to track down how the homes had changed hands, how much the white families had sold them for, how much the black families had paid, and who was involved as the middleman in these transactions. It was an arduous task, given the obscurity of the records. But the results were stunning. They were able to document what many people already knew: both white and black families had been seriously cheated, with black families sometimes paying twice what the white families had received. It was a lucrative business. The panic peddlers made large sums on these transactions, and they sometimes sold the contracts to other investors protected by blind trusts set up in local banks, giving many Chicago investors a stake in this system of exploitation. Some believed that many powerful people in the Democratic machine also benefited. The families put their payments in escrow, for future payment to the sellers after the contracts had been renegotiated. The payment strike went on for many months, sometimes years, between 1968 and the early 1970s, with about 500 families participating. For their own reasons, the contract sellers did not move quickly to evict the nonpaying families, but eventually, when the evictions began, crowds of CBL members and their allies gathered at the homes to move the evicted families back in. For many months, the sheriff and his deputies backed off when confronted with hundreds of neighborhood residents determined to halt the evictions. These dramatic confrontations brought a lot of public attention to the whole issue of contract buying. As the public became more aware of how the contract sales process drastically exploited both black and white homeowners, support came from unexpected places. Volunteers, mostly women, came into Lawndale from the northern suburbs to attend meetings and work in the CBL office. Rabbi Robert Marx from the Jewish Council for Urban Affairs was an important ally; his presence and the additional support he mobilized were critical to broadening the group’s base. At one point, the Contract Buyers League was raising money for a bond fund to appeal evictions; each appeal cost $3,000 to $5,000, far beyond the means of most families. The Chicago Province of the Jesuits agreed to put up $100,000 for the bond fund, and other Jesuit provinces collectively came up with another $150,000. “I thought I’d died and gone to heaven,” Jack Macnamara said upon hearing this news. Macnamara also raised funds from allies on the wealthy North Shore and from supporters such as Tom Foran, a US attorney, and Gordon Sherman, founder of Midas Muffler. Thirty attorneys from prominent Chicago law firms offered pro bono legal services to the families facing eviction due to the payment strike. Chief among these firms was the well known Jenner and Block. Other Chicago attorneys, including Marshall Patner, Tom Sullivan, and Bob Ming, also provided critical support. Paralleling the payment strikes were class-action lawsuits seeking legal redress for the exploitative contracts. The battle through the courts was long and arduous. The West Side case first went to court in November 1975, and the South Side case began in 1979. In the end, both cases were lost, and the last appeal was rejected in 1983. Despite these losses, a second set of lawsuits challenging the Forcible Detainer and Entry Act—the Illinois law governing evictions—went to the Illinois Supreme Court. In Rosewood v. Fisher, the court ruled in 1970 that the nature of the contracts—whether fraudulent or usurious or otherwise irregular—could be raised as a defense in an eviction case, giving contract buyers a chance to tell their stories. In a second case, the Durhams, a family from the South Side, argued that the eviction law discriminated against the poor because it required the posting of a large bond—several thousand dollars—to file an appeal to an eviction order. In 1972 the Illinois Supreme Court ruled in their favor, declaring invalid the part of the law requiring large bonds before filing an appeal. By July 1971, 155 contracts had been renegotiated, with an average saving of $14,000 (about half the purchase price for a house). Other families were finally able to obtain regular mortgages; the FHA had changed its policies and was beginning to make mortgage insurance—and thus mortgages—available in black communities on a limited basis. Moved by the sight of families being evicted in January’s cold, powerhouse black real estate developer Dempsey Travis found mortgage funds through black-owned insurers for one group of buyers. Eventually, the sheriff and the Chicago police devised a method to conduct evictions without interference: by having the city police cordon off the street so that supporters could not reach the house. Approximately seventy families permanently lost their homes. By the time these evictions happened, however, at least some families had saved sufficient funds in the escrow accounts to buy other homes. Growing publicity and public support suggest that the Contract Buyers League had a substantial effect on attitudes in the larger community. James Bevel had often explained that in nonviolent direct action campaigns, the goal is to bring the oppression out into the open; when many people see the injustice, and see it as a violation of their own values, they will support the movement’s goals and call for change. Satter describes this shift in public opinion as one of the consequences of this movement. Mary Lou Finley is a sociologist and professor emeritus at Antioch University Seattle. She is the co-editor of “The Chicago Freedom Movement: Martin Luther King Jr. and Civil Rights Activism in the North” and co-author of "Doing Democracy: the MAP Model for Organizing Social Movements." The co-editor of an upcoming book recounts the outset of Dr. Martin Luther King Jr.’s Union to End Slums campaign in Chicago. Advocates want to see Mark Diamond face criminal charges and be put out of business permanently, while other black homeowners he targeted hope to obtain restitution soon.